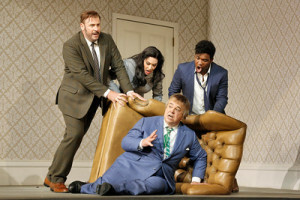 San Francisco Opera presented Gaetano Donizeti’s delightful opera buffa, Don Pasquale, September 28–October 15 at The War Memorial Opera House. It was tremendous fun. The music is beautiful and funny. The four leads were splendid. It was a night to cheer Donizetti’s brilliance and the accomplishments of singers, conductor, orchestra, chorus, directors and designers whose work combined to create complete theater. Premiered in 1843, the libretto, also written by Donzetti, puts stock figures in predictable actions with and against each other, but the plot twists in ingenious ways. Opera buffa is the opposite of opera seria, the serious dramas.There is a wealthy man in his 70s. His nephew, Ernesto, refuses to marry the wealthy woman his uncle selected for him; Ernesto loves a poor girl, Norina. The uncle is tired of supporting him, disowns him, and decides to marry a young woman. His doctor and alleged friend, Malatesta, takes Ernesto’s side and plots with Ernesto’s true love. She will present herself as sweet, innocent Sofronia, marry Don Pasquale, then make him demand a divorce to escape her domineering behavior and immense expenses. Norina will be able to marry Ernesto with Don Pasquale’s blessing and his money. In this production created by Director Laurent Pelly, the nephew is a spoiled, lazy boy sponging off his rich uncle, not the pure rebel against authority he could have been. Norina also is something more and less than her character might have been in the commedia dell’arte from which opera buffa developed. She is a schemer who might be motivated primarily by love but might not. Even Malatesta, presented as the friend of both Don Pasquale and Ernesto seems to be motivated not only by friendship but also a pleasure in playing cruel games. 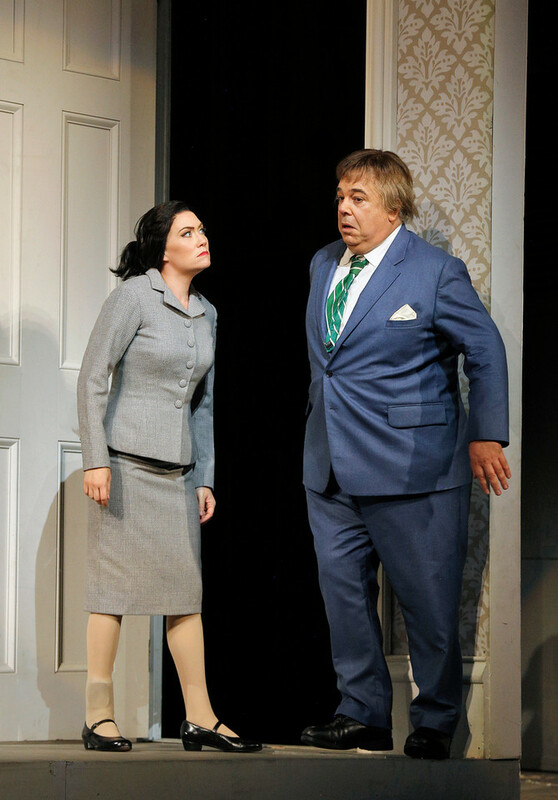 For this viewer, it was easy to feel sorry for Don Pasquale who put on a new suit and a toupee to meet his bride. He looked ridiculous but was so happy. The lesson, the closing song says, is that old men should not try to marry. And yet, though the others made him a fool and he sees that he acted the fool on his own, there was a charming liveliness in his hopes. Bass Baritone Maurizio Muraro as Don Pasquale was amazing. His singing was great, and his physical comedy timing perfect. His expressions and actions were very, very funny. 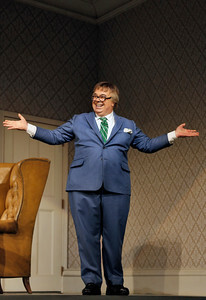 His ability to sing the rapid fire patter songs of Don Pasquale was astonishing; every note and syllable was clear and understandable, if one’s brain could keep up. His actions when he transformed himself into what he thought would attract the young woman were funny, his anger at Sofronia’s expenditures was funny, but over all, it was touching to see him try to cope with the abuse dished out by this angel turned devil. 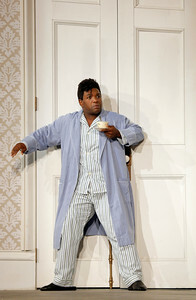 Lawrence Brownlee, internationally acclaimed tenor, made his SF Opera debut as Ernesto. He was a lout, a lover, a disappointed suitor, and a house guest tossed out of the house. He played it all with fantastic aplomb always buoyed by his lovely lyric tenor voice. He was so romantic perched on the roof of his uncle’s house, longing for Norina, and so funny packing a closetful of shirts and then trying to figure out how to carry all his suitcases. Director Pelly’s idea for the production was inspired by Italian movies from the 1950s. 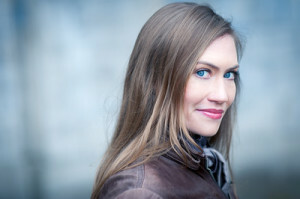 When the audience first sees Heidi Stober as Norina, she is in a black slip, leaning against the wall of her squalid room, and admiring a center-fold. Her clothes are piled on the floor. She has a cigarette. This image of the character does not appear again, but reveals some tawdry tendencies behind Sofronia. Ms Stober’s strong, dramatic voice made her dominance of the Don and plotting with Malatesta believable. Think ahead to a sequel in which Ernesto, not used to fending for himself, finds he’s married someone better at bossing him around than his uncle had been. 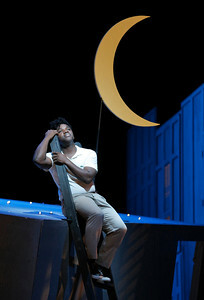 Baritone Lucas Meachem has a long relationship with the SF Opera. He was a Merola and an Adler Fellow and has sung numerous roles. 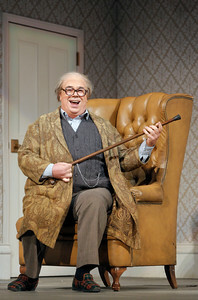 It was exciting to see him in a different setting fulfilling the demands of comedy with distinction. His energetic patter duets with Muraro were a pleasure. Malatesta’s double crossing drove the story ahead effortlessly. On October 4 and 7 the role was played by Edward Nelson, an Adler Fellow. Bojan Knezevic added comic confusion in a cameo role as the Notary who pretended to marry the Don and Norina. The SF Opera Chorus marched onstage as an army of gossipy servants hired by Sofronia. The SF Opera Orchestra was conducted by Giuseppe Finzi. From the beginning of the Overture, it was clear we were in for something extraordinary. Donizetti’s music represented all of the actions and characters. There was a theme which danced and limped that sounded like Don Pasquale’s happiness and hesitations. Theater wisdom says, “Tragedy is easy; comedy is hard.” Impossible to imagine if Donizetti found writing Lucia di Lammermoor easy, but the all star cast of this Don Pasquale acted and sang a comic triumph. 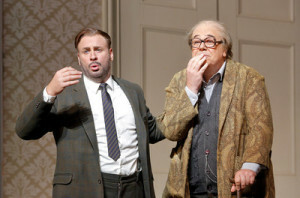 This entry was posted in Hedgehog Highlights and tagged Bojan Knezevic, Don Pasquale, Donizetti, Edward Nelson, Giuseppe Finzi, Heidi Stober, Laurent Finzi, Lawrence Brownlee, Lucas Meachem, maurizio Muraro, San Francisco Opera, San Francisco Opera Chorus, War Memorial Opera House on October 17, 2016 by Leslie.